The Kildonan Centre is a few minutes drive south from Howmore and is open from April until October. 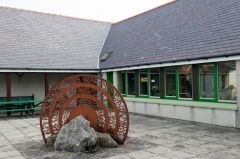 Here there is a museum, built on the site of an old school, a craft shop, an archive dedicated to Margaret Fay Shaw, a room for archaeologists to clean and examine their finds, and a cafe as well as a room suitable for events and concerts. It is a local facility that is home the South Uist Historical Society. For these exploring the Howmore district this is a must.